Name Society, the Maronite Adult Club, Maronteen Club and Altar Boys. The present pastor is Father Elias Abbi-Sarkis. The Cleveland Grays, organized in 1837 as a parade and military unit were associated with early Cleveland history long before the immigration into Cleveland of the Syrian-Lebanese families who founded St. George Antiochian Orthodox Church. In 1893, during the peak years of Arab immigration to Cleveland, the Grays built their Armory at Bolivar Road. It was an imposing stone and brick fortress, with turrets and towers reminiscent of Crusader castles built centuries before on the deserts and plains of the Middle East. Here the Grays conducted their meetings, performed their drills, held band practice and shared convivial hours with fellow members in the club rooms of the Armory. A haze of cigar smoke thickened the air on weekday evenings, as the voices of men at their sports echoed through the Billiards room. The Armory was used for civic and cultural activities -- dances, convention meetings, the Centennial celebrations of 1896. 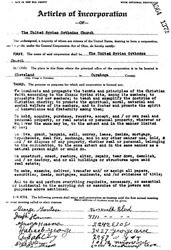 It was not yet a time when immigrants and the established "WASP" community were meeting generally on intimate social levels, yet someone in that early Arab community and someone among the "establishment" must have enjoyed the kind of friendship that linked the history of the Cleveland Grays with that of the Orthodox Syrian Lebanese community of Cleveland. The names of those two individuals, the "American," and the trans­planted Syrian, who negotiated the arrangement are lost in history, but some time in those early years of Grays Armory and the Orthodox community the Billiards Room at the Armory was witness to another kind of gathering. The haze of cigar smoke was replaced by the sweet pungency of incense, rising from an acolyte's censor, and the happy sportsman voices, deferred on Sundays to the intonations of the cantor as the Liturgy of the Eastern rite Antiochian church was sung for the faithful. With no church or priest of their own, the faithful Orthodox were thus able to retain their identity and preserve the rite of the mother church in Syria. Grays Armory as well as St. Elias Melchite Catholic Church, was always included with happy remembrance, in the recounting of the church history of Cleveland's Orthodox connunity. After years of Sunday services in these and other locations, members of the congregation in 1926, met with Archbisop Victor Abou Assaly, North America's first Metropolitan, in the home of Abraham Sahley on West 14th Street. They had waited more than thirty years. Finally the moment of decision had arrived. They would have a church of their own in Cleveland. Two homes on West 14th and Buhrer Avenue were purchased with the intention of using their site as a future church building, but eventually this plan was changed. appointment of Father Meena as first pastor of St. George Church by the Metropolitan, Archbishop Assaly. This Orthodox congregation and its foresighted new pastor from the beginning seemed to be early advocates of an ecumenism not experienced until years later by other congregations. The Seventh Day Adventists had a church on West 14th and Buhrer and the new Pastor and his congregation made arrangements with Adventist Church leaders to hold Divine Liturgy on Sundays in the Adventist church. Some months later, a small group of co-signers purchased a church at West 14th and Starkweather for $38,000. These early founders, Habeeb George, George Gantose, Joseph Hanna, George Hanna, Abraham Sahley and Nasef Salim presented the key to the "new" church to Father Meena in July of 1928. The congregation of this new Orthodox church in Cleveland immediately threw their energies into the formation of a Ladies Society, a Choir, a Band, and a church council. They raised funds with card socials, bazaars, picnics, and Thanksgiving dinners. The band, a favorite project of the new pastor, became well known and performed, not only at church events but also at many civic functions. Within five years, funds had been accumulated to decorate and ornament the church. Sadly, immediately after the celebration to mark this milestone on May of 1933, the most spectacular fire on Cleveland's west side to that date totally destroyed the newly ornamented church, leaving only the skeletal four walls standing. The initial grief was followed by renewed vigor and enthusiasm, and the same parishioners who had just seen their money and labor go up in smoke, threw themselves into the task of rebuilding. Another mortgage was assumed. Finally, in 1935, the newly constructed church was consecrated by Archmandrite Antony Bashir. In less than ten years, on November 14, 1943, at a testimonial dinner at the old Carter Hotel, the mortgage was burned. Father Elias Meena moved to California in 1951 after a service of twenty-five years to St. George. It was a parting frought with emotion. This priest who had worked with hammer and saw, side by side with Kareem Courey, the carpenter, in the rebuilding after the fire, had endeared himself to his parishioners. His leadership qualities and driving force had brought the church through disaster and depression to enduring stability. Other pastors to serve this parish in the years following Father Meena's pastorate were Fathers George Simon, Paul Moses, Elias Nader, Thomas Skaff, Philip Saliba, Nicholas Van Such and Gibran Ramlaoui. Philip Saliba was ordained in Cleveland in 1959, in St. George, to which he had come as an arch deacon. He became pastor soon after ordin­ation. He was elevated to Archbishop seven years later and is at the present time the highest ranking Orthodox religious leader in the Northern Hemisphere, Metropolitan of North America and Canada. He holds jurisdiction over Australia as well. Rev. Gibran Ramlaoui was transferred from Cleveland to become Bishop of Australia. The first Sunday School at St. George was organized in 1940, and its first, superintendent was Lillian Sahley, (Mrs. Farris) the daughter of Abraham and Deebe Sahley, early founders. Following her death, her husband, Farris, provided an endowment toward construction of a Sunday School building in her memory. 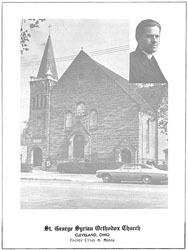 The expansion program initiated in 1963 included a new Educational and Cultural center, of which the Sunday School was a part. A third mortgage was burned in 1968 on the date of the 40th anniversary of St. George Church -- that time for the Educational and Cultural Center, the first of its kind in the North American Archdiocese. The ornamentation in the interior of the church is Byzantine in character, although two wall paintings are typically Latin. These depict the Last Supper and the Resurrection. Of them. Father James C. Meena, the present pastor and son of the first pastor, says: "There is no explanation for them except that my father always liked the originals and decided these would do very well for our interior. He had a sense of ecumenism before his time, and these are among the few, if any other, Roman and western religious paintings in an Orthodox Church in America." The icon wall, the "iconostasis" separating the sanctuary main part of the church, stands from 1935 when the newly reconstructed church was opened. niches framing the brilliant glowing colors and exquisite gold leaf of the icons. David Deeb at that time was sixty years old, and this was his gift of labor for the new church. In 1954, at the age of seventy-nine, this same artisan, his hands twisted and trembling with arthritis again set himself a labor of love for his church. "The church must have a Bishops' Throne," he said, noting the tradition of this fixture for the interior of an Orthodox church. "I will build this throne, my last work, as a legacy to my church, and I will do it myself." David Deeb then proceeded, slowly and painfully, to design and then build, alone and unaided, a fourteen foot throne. Cupolaedand canopied, it was carved of dark walnut. Into the magnificent gleaming wood Mr. Deeb carefully set inlaid ebony, rose­wood and ivory in an ornamentation of religious symbols. While it did indeed remain his last major work, Mr. Deeb lived an additional fifteen years, his eyes resting with satisfaction each Sunday upon that throne at the right of the icon wall. 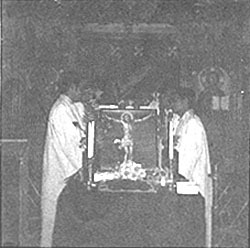 The tabernacle in the church was the core around which his social, cultural and religious life had revolved for nearly half a century. Kareem Courey, the carpenter, built the first wooden casket which was carried in procession each Good Friday to commemorate the crucifixion and death of Christ. "There have been others since, and now they have an aluminum one," said his son, Naissef Courey, "But one of my father's greatest joys is that the coffin he built was the first to be carried around the church and into West 14th Street during the Good Friday procession." Of the five hundred families in St. George Parish today, many bear the names of those early immigrants associated with the church from its early history. There are a number of George families, among them the children and grandchildren of Habeeb George, one of the co-signers and of his brother, Shaheen George. Also included among the present parishioners are the families of other co-founders -- the children of Abraham and Deebe Sahley; the Gantose families, the Hannas, the Salims. Other families carry the names of Abraham, Abdutlah, Assad, Aboid, Ameen, Betor, Bourjailly, Courey, Darwish, Deeb, Esber, Easa, Elias, Farage, Farris, Farah, Fadil, Haddad, Houry, Haikim, Harants, Khoury, Kaleal, Kaleel, Karam, Karim, Kerby, Isaacs, Jacob, Joseph, Lakis, Mady, Nader, Namy, Rahal, Sadallah, Sadie, Shiban, Simon, Shiekh, Saba, Shahady, Sarkis, Saah, Shawan, Shakour, Shaker, Thomas, Yunis and Zeen. With changing social patterns and increasing mixed marriages, many families now carry names with European roots, as well as names identifying Mediterranean cultures other than the Arabic, such as Greek, and Italian. Such names as Daddoukh and Yahyah were long associated with St. George Antiochian Orthodox Church. Says one parishioner: "Mr. Abbas Daddoukh and Dr. Yahyah are Druze by religion, but the Druze had no temple or meeting place for a long time, and many of the Druze families participated in our services, and joined our organizations." Pastors of St. George have throughout the years encouraged group participation in religious and cultural activities and a number of organ­izations meeting at the church are involved in national Orthodox activities. SOYO, (Syrian Orthodox Youth Organization) has a strong chapter in Cleveland. Many of the St. George young people, are involved on the state and national level. Other groups include the St. George Choir, St. George Church School Guild, St. George Ladies Society, St. George Teen Club and St. George Altar Boys. Social and cultural groups include the United Aramoon Society and the Kouba Club, which are named for the towns in Lebanon from which their early founders immigrated. The present pastor of St. George Church is the Very Rev. James C. Meena, the second son of the church's founding pastor. Father Elias Meena. There was once another James Meena, the first son of Father Elias Meena. An old program book for a St. George function contains a memorial which reads: 1st Lieutenant James Meena, born 1916, killed in action November 11, 1944. That James Meena was a graduate of the Cleveland Institute of Music and already singing in opera and studying for the priesthood when he was called into service during World War II where he lost his life. The baptismal name of the present Father Meena was Carnal. After serving with the army in North Africa and Italy, he came home to study for the priesthood in his brother's place. Upon ordination, he assumed his brother's name, and has been known since that date in 1950 as James C. Meena. His parishioners call him Father James. Father Meena at first served the North American Diocese in teaching capacities, and was several times director of Religious Education and Sacred Music for the American Archdiocese. Before assuming the pastorate of St. George in 1970, Father Meena served in St. Nicholas Cathedral in Los Angeles, and St. George Church in Pittsburgh, and was once assigned to travel as a delegate in the Middle East to the Holy Synod in Damascus and Beirut. While in St. George in Pittsburgh, he hosted a radio-TV show for two years on WIIC, and served on the Mayor's Advisory Committee on Human Relations. He is a graduate of Baldwin Wallace College in Berea, and has studied Musicology, Arabic, Music Composition and Theory at the University of Southern California, UCLA, and Duquesne. Father Meena is the author of three Hymnals for the Divine Liturgy, and has translated the Tschaikowsky Liturgy from Slavonic to English. He is married to the former Ruth Farris and is the father of a daughter and three sons. Under his direction, the church has expanded its activities into areas of community involvement, particularly in the Tremont poverty and welfare programs, and has offered its meeting rooms and facilities to programs developed by other organizations within the Greater Cleveland area. was of African origin. St. Mark was the author of the earliest Gospel. In the year 42 A.D., he came to Egypt bringing the Christian faith to that old civilization. He preached in Alexandria where he founded the Church of Egypt. In 451, the Coptic church broke away from Rome because of some disputes about the nature of Christ. The present head of the Coptic Orthodox Church of Egypt is H. H. Pope Shenouda III, of Alexandria and patriarch of the see of St. Mark. The church has some 1.5 million members in Egypt and 3.5 million in Ethiopia. Pope Shenouda III appointed a six member committee to represent the Coptic Church in America. Two of these members live in Cleveland. One is Mr. Ahdy G. Mansour, Executive Director of the Lake County Society for Crippled Children and Adults, and the other is Father Mikhail E. Mikhail, Pastor of St. Mark Coptic Orthodox Church in Parma. Father Mikhail came to America with his wife, Seham, in 1975 when he was appointed Pastor of St. Mark's Church. The church was officially established on February 25, 1971 even though services were held every two months. Previous to that time, services were held every two months in the private residence for 10 Coptic families since 1968 by a visiting priest from Toronto, Canada. Presently, St. Mark's Coptic Church serves all Coptic faith living in Ohio, most of Pennsylvania, West Virginia and Minnesota. The church has approximately 400 members in Cleveland, an additional 200 in other parts of Ohio, 120 in Pennsylvania, and 200 in Minnesota. Cleveland State University President, Dr. Walter B. Waetjen, and the Provost and Executive Vice President, John A. 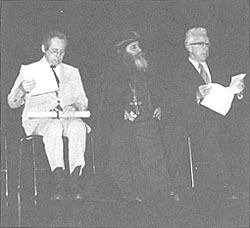 Flower, hosted a program in honor of H. H. Pope Shenouda III during his 1977 visit to Cleveland. 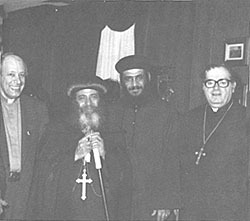 Left to right: Father Hauk, St. Maron Church, H. H. Pope Shenouda III, Reverend Mikhail E. Mikhail and Father Meena, St. George. Inside the St. Mark Coptic Orthodox Church.